Wow! What a meeting we had this past week! I’m exhausted, but my knitting mojo has definitely kicked in. After knitting with yards and yards of acrylic for the Yarn Bombing, I can’t wait to get some nice, squishy wool in my hands! I haven’t knit for myself for the past year, so this fall I plan to focus on a sweater or two and an afghan. Enough said, let’s jump into a recount of our last meeting! Show & Tell: You all know that this is ALWAYS my favorite part of every meeting! 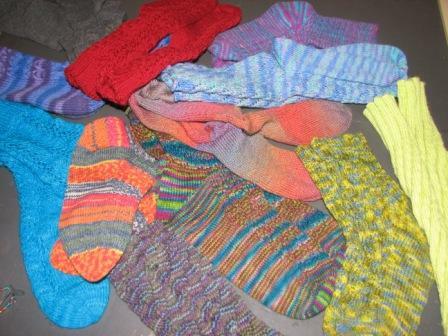 There were tons of yarn bombing projects and quite a few socks for the Secret Sock Exchange. Laura brought a beautiful sunflower shawl, Debbe’s cool Reader’s Wrap, sweaters, accessories and so many more projects! Since we were running late on time, I wasn’t able to snap photos during the break. Sorry! Check out the Ravelry page for projects (although I don’t see many of them posted quite yet). Lorrie took 1st Place with her Lady Eleanor wrap. Entrelac says it all. She received Gold Medal Stitch Markers & handspun. Janice took 2nd Place with her Winter Flame Shawl. She received Silver Medal Stitch Markers & yarn. Anne took 3rd Place with her Anemone Hat. She received Bronze Medal Stitch Markers & a pattern. Marnette placed as a participant with her baby sweater & scarf. All participants received a Ravellenic 2012 Stitch Marker. Debbe, Amberle & Kim placed as participants. I failed miserably and just watched from the stands through most of it. Thanks to everyone who participated in this year’s games! Thousands of projects were completed during the two week period! Almost 20 members and friends participated in the first Secret Sock Exchange! About 4 months ago, we learned how to make a foot form (basically a foot manequin out of duct tape) and tossed all of our feet into a pile). Everyone selected a foot and knit a pair of socks to fit their Secret Sock buddy. At the August & September Guild meetings, we exchanged our socks and found out who our knitting buddy was! This was so much fun. 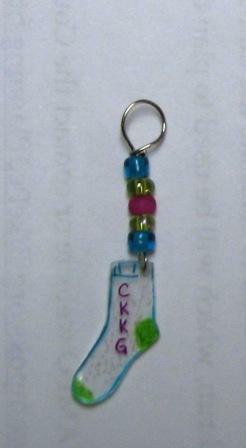 All participants received a custom sock stitch marker as a thank you from the Guild. *If you didn’t get your stitch marker, please let us know! Many of you may not know that Joan, a newer member of the Guild, has also worked in the knitting design/publishing world for several years! Joan began working for Leisure Arts as a Tech Editor of knitting patterns and continues tech editting for companies and several independent designers. Joan explained that before a pattern is published (typically), most designers and/or companies will hire a tech editor to check for any errors, make sure that all the math matches the gauge specified in the pattern, create illustrations and schematics if needed and sometimes make sure the English translation is correct. Many of you wonder why the designer can’t just do this portion of the pattern writing? Often times, the designer is so close to the project that they may not notice if a number gets inverted or dropped from the pattern…causing us knitters hours of frustration if we don’t catch it. We’ve ALL been there! Also, I can definitely say, as an amateur designer, that trying to put your ideas into words written on a pattern is one of the hardest parts! There are so many ways to say the same process that often this is where patterns can fall short. I have twisted Joan’s arm to write an article for our newsletter about TNNA and other items she didn’t get time to cover. Thanks Joan!!!! Also, during the discussion, Laura and a few others in the Guild mentioned that they help designers Test Knit new patterns. If you are intersted in doing this (sometimes you get to keep the pattern and/or they may pay), check out the Ravelry page here. If you are intereted in designing, this may help you get a better understanding of the process and also develop relationships with other designers! Wow! What can I say about the Cover It Up! Yarn Bombing event that hasn’t already been said! If you haven’t been able to make it to the WSU campus (and you still have through this weekend-although some peices may have wandered off already), then check out the Facebook page that has tons of photos and discussion by the group. Thank you to all of our members and friends who came through to make this an amazing event! We gathered up overflowing bags of knitting projects to contribute to the Grafly Sculpture Garden and throughout the campus. Marnette’s cute birdie landed on the bike rack in front of the Ulrich Museum. It was awesome seeing the students, families and kids interact with the art peices. 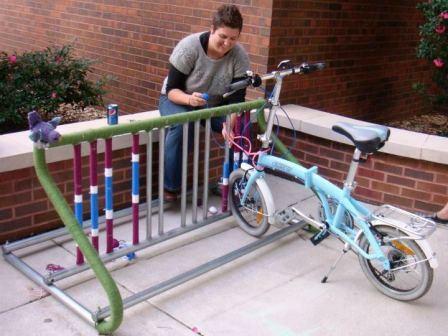 Kim Yarn Boming the bike rack on Friday night. Nhung had the audacity to park her bike in the rack before I was finished! I forgave her since she has a cool bike! I better end this post before I reach the record for the world’s longest update. See you next month for the October Guild meeting, Tuesday October 9th from 6-8pm – Harvey County Courthouse (Newton). We have an exciting program! Next Next post: October Guild Meeting!